Gardens are always alluring, provided they sport fully blossomed and healthy flowers, exude an aura of fragrance and contribute to the serenity of the setting. Gardens with no flowers or unhealthy plants will look dull. They would certainly be uninviting. For captivating gardens, you need to understand the subtle art and the entire gamut of science that goes into gardening. 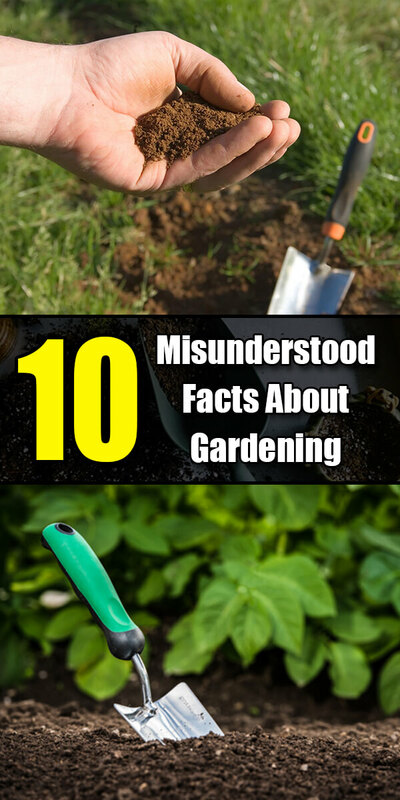 Here are ten most misunderstood facts about gardens. “The soil needs to be nourished and hence you require fertilizers” – This is a myth because the soil has natural ingredients to support growth of plants or weeds. The nature of the composition of the soil will determine what you can grow there. Always get your soil tested before you try to grow anything. It could be sunflower or orchids, tomatoes or carrots. Your soil should be tested before you grow anything and then periodically to stay informed about the health of the soil. Adding fertilizer or any kind of nutrients for the soil to enrich its composition is not a sure recipe to have wonderful produce. How you grow your flowers, plants and vegetables, where your garden is exactly, the exact methodologies will influence the produce. Do not add any fertilizer or pesticide that will kill the microorganisms in the soil. A small teaspoon of soil will have more microorganisms than the human populace on earth. Don’t be taken aback by this reality and don’t fear the microorganisms. They are integral to the composition of the soil. Understand the role of water. Many people just water their plants according to a preset schedule. The soil must have enough water but all of it should not be supplied as and when needed. You cannot grow water intensive plants all year. You have to rotate them so the soil has time to replenish. Don’t get rid of all biodegradable materials from the surface. You may want a clean garden but getting rid of all the leaves or any natural plant material that can decompose on its own will deprive the soil of essential nutrients. Aeration should be attended to gently. Unless you are planting trees or seeds that will need deeper digging, you can do with just a few centimeters of aeration. Too much water will damage your garden and can even destroy the fruits, flowers and vegetables. The role of sunlight is often misunderstood. It is a case of plenty or too little in most cases. Try to balance the exposure to sunlight depending on the weather. Always have the right combination of fruits, flowers and vegetables. Contrasting plants will not only be difficult to attend to but they may hinder the growth of one another. Consider looking into “companion planting” which is where you plant plants next to each other that have attributes that compliment the other one.